Ok, so you have a super-critical process which is important for all of your clients. You can stress out about it and keep it all in your mind, in your email, post it all over your desk and walls, even put notes on the palm of your hand – and you can still miss something. The first thing you’re going to miss is control over your process, over what your team is doing, which task has what status. You’ll never see it clearly with ordinary tools, unless you carefully fill out a relevant Excel file, for example. And this, unfortunately, takes time. And we all need more than 24 hours in a day to finish all tasks. It’s great if you have an online interactive tool where you keep all your work content available to you and your team, right? And it’s bad at the same time because you’re working mostly in Outlook and switching between applications, however smart they are, which is annoying. Keep working in Outlook and get full process management functionality in it, including processes and collaborative work. The name of the application that comes to your rescue is Comindware Tracker. 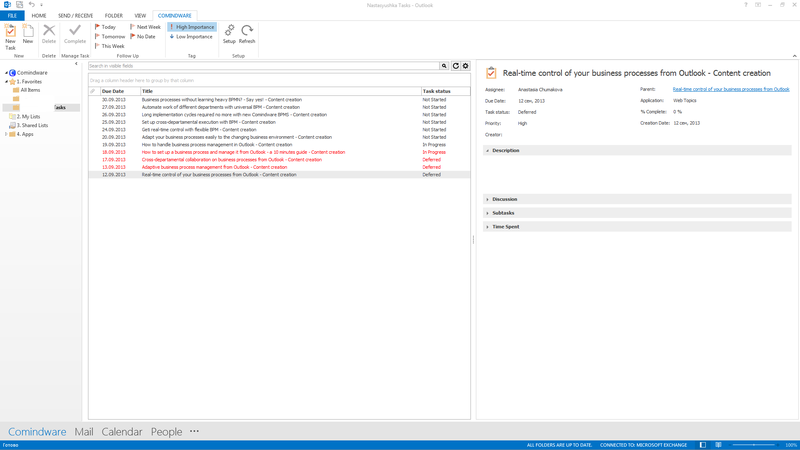 Comindware Tasks for Outlook is a small Outlook extension with powerful adaptive process management and collaboration capabilities. You can see everything about your current project in a Comindware tab inside Outlook when you’re using it. And by saying everything I really mean everything: statuses, tasks, deadlines, priorities, attachments, history, work items, lists of work items, forms, history, personal and team task list. It offers ultimate control over your business processes combined with the ease of adaptation of how a process is automated to how you want it to be executed. Basically, this is all you need in order to complete projects up to 35% faster. And you can have as many projects as you want at the same time with the lists and folder tree. Advanced customization, filtering, and search options won’t let you get lost. 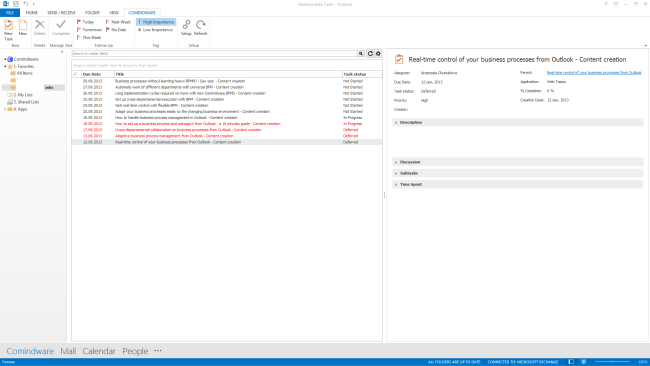 Try to control your processes directly from Outlook – now. You’re one click away from it and for the next 30 days it’ll be free.